Gender bias exists in every aspect of society—from the workplace to the political arena. The gender gap affects our children's education, the size of the paycheck we bring home, and why women still lag behind men in certain careers. As media coverage of female politicians has proven in recent elections, gender bias has crossed the aisle and it is not as rare as we might hope. It has challenged Democrats and Republicans, touched candidates in presidential, congressional, and local elections, and has been witnessed toward nominees for high government positions. 2008 Vice Presidential candidate Sarah Palin was noted as a former beauty queen and subject to other remarks, neither of which had nothing to do with her 2008 run. Hilary Clinton fell victim to misogyny countless times in both her 2008 and 2016 bids for the White House. During her 2009 confirmation hearing for the Supreme Court, Sonia Sotomayor was asked by Senator Lindsey Graham about a "temperament problem" and he later referred to a possible "meltdown." A 2001 mayoral candidate in Allentown, Pennsylvania was publicly asked about her measurements before a delivering speech. These bring up the question that if any of these women had been men, would they have been subjected to the same treatment? Sexism in politics is real and, unfortunately, we see it on a regular basis. Do women see themselves accurately reflected on television and film, in advertising, and in print and broadcast news? Most would say that they don't, but that it is improving. Maybe that's because only a small percentage of media decision-makers—those with enough clout to determine content—are female. If you want to find news about women's issues and from a female perspective, there are a handful of outlets you can turn to. Traditional outlets are getting better at handling bias, though some women's advocates feel that it is still not enough. The members of the media often become the headlines themselves. Rush Limbaugh infamously has had a number of comments about women which many people have found inflammatory and derogatory. ESPN's Erin Andrews was the victim of a famous "peephole" incident in 2008. And in 2016 and 17, Fox News was plagued with sexual harassment allegations against leaders in the broadcast company. Beyond the news media, some women also find issue with other types of programming. For example, teen pregnancy shows on television raise the question of whether they are glorifying the issue or helping with abstinence. In other instances, shows may insensitively handle female body image issues such as weight. Older women can also be portrayed in negative ways and, in some cases, lose their jobs in media because they're no longer "young enough." Why do women still earn only 80 cents for every dollar men earn? The primary reason is that it's due to gender bias in the workplace and this is an issue that affects everyone. Reports do show that the pay gap between men and women is improving. In the 1960s, American women made just 60 percent on average as their male colleagues. By 2015, that had increased to an 80 percent average nationwide, though some states are not yet near that mark. Much of this decrease in the pay gap is attributed to women seeking higher levels of employment. Today, more women are entering fields in science and technology and becoming leaders in business and industry. There are also a number of careers in which women do make more than men. Inequality in the workplace extends beyond how much money we make. Sexual discrimination and harassment remain hot topics for working women. 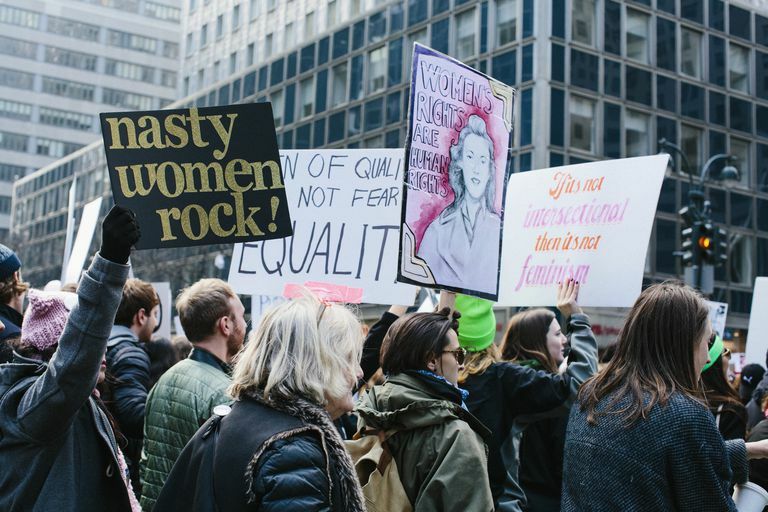 Title VII of the 1964 Civil Rights Act is designed to protect against employment discrimination, but it does not protect every woman and cases can be difficult to prove. Higher education is another venue in which gender and race bias remain a factor. A 2014 study suggests that on the university level, even well-intentioned academic professionals can demonstrate a preference toward white men. The good news in all of this is that women's issues remain at the forefront of dialogue in the United States. Progress has been made over the last few decades and much of it is very significant. Advocates continue to push against bias and it remains a right of every woman to be able to stand up for herself and others. If people stop speaking out, these matters will continue and we cannot work on what remains to be done for true equality. The American Association of University Women (AAUW). The Simple Truth About the Gender Pay Gap. 2017. Milkman KL, Akinola M, Chugh D. “What Happens Before? A Field Experiment Exploring How Pay and Representation Differentially Shape Bias on the Pathway into Organizations.” Journal of Applied Psychology. 2015;100(6):1678-712. Ward M. 10 Jobs Where Women Earn More Than Men. CNBC. 2016.